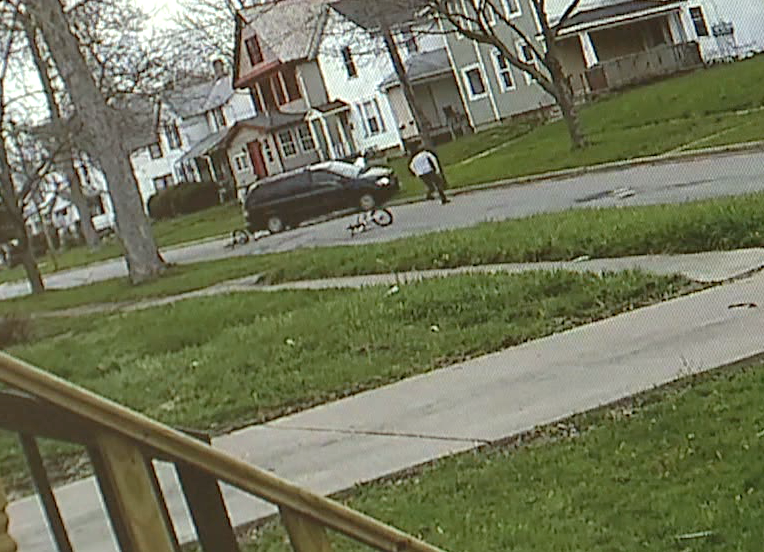 A disturbing road rage case was caught on surveillance video in Elyria, Ohio on Monday. Three young men were out riding their bikes on 9th street when a van pulled up behind them. In the video, you can see the driver of a blue Dodge Caravan hit one young man, then drive after the others. "His knuckles made contact with the van, they were actually cut," Elyria Police Captain Chris Costantino told Cleveland-based WEWS. The young man then hopped off his bike and ran up on a lawn. The van followed him. His friend ran to help, saying something to the driver, before the van hit him too. According to police, the van ran over his foot. The youngest of the three, just 14 years old, stood behind a car parked on the street and managed to stay away from the van. The three victims told police he was yelling threats out the window the whole time. "He made reference to the fact he would run over the other ones too," Captain Costantino said. The driver is described as a heavyset middle-aged man. "Obviously this is a person that we want to find and take into custody quickly before he harms someone else," Captain Costantino said. "I think that this person probably lives in this general area, so I hope someone will come forward quickly with information so we can get him identified, or maybe he'll turn himself in once this gets out." According to Elyria police, the driver could be looking at a felonious assault charge.